CAC Plastics LLC. 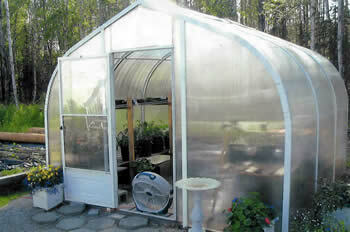 can help you build the greenhouse of your dreams. Custom sized greenhouses based on your needs for those giant Alaska cabbages our valley is world famous for, or just great tasting tomatoes or beautiful flowers! CAC Plastics offers a wide variety of multiwall and corrugated polycarbonate sheets and PVC products that are perfect for greenhouse type applications. Do-it-yourselfers are increasingly discovering the extreme versatility of polycarbonate. Whether you are looking to build a storage building for your equipment or provide shelter to your pets, or building a seed house, we offer a variety of products that are lightweight, durable, and easy to install. Polycarbonate sheets are available in a wide range of sizes and gauges. SHeets are offered with UV protection thus retaining their quality for years to come. Polycarbonate multiwall and corrugated sheets combine the characteristics of impact strength, flexibility, lightweight, transparency and the ability to withstand a wide range of temperatures. The same extrusions used for overhead glazing, also work great for vertical glazing of multiwall sheets for greenhouse type building projects.